I believe you mentioned something similar around new years in Detroit. Apparently, it doesn’t have to be a special holiday. The following is from a military email. WHAT: Possibility that errant small-arms rounds [DS: To our friends in Dearbornistan, that means “stray bullets”] may impact JBB this evening as a result of celebratory fire from outside the base. Result of Iraq playing Australia in the Asian Cup. WHEN: Today, 22 Jan anytime after 16:25L. If Iraq wins, fire most likely to occur between 1730L and 1900L. Yup, “Religion of Peace” . . . and pieces. Sooo glad we sacrificed American boys’ lives to take Iraq from despot Saddam Hussein to give it to these equally classy acts. Mission accomplished, indeed. These people don’t need American-style democracy. They need an authoritarian dictator to keep the peace. In case you were wondering, Iraq lost to Australia in overtime, so some American soldiers in Iraq, thankfully, didn’t have to die because these barbarians won a soccer match. Hey, don’t say I didn’t warn you about soccer. And Islam. In Islam, violence is a form of celebration as well as release. To be fair, its an outlet for them also seen in repressive regimes. You can change the nature of the regime but you can’t change the nature of the ideology. If Islam did not glorify violence as an every day affair, not just jihad, we might be able to characterize it as a civilization. The Romans fed people to the lions for entertainment and did torture and other barbarous things but fortunately they are no more. Islam will be with us for a long time yet and they are more cruel to human dignity and freedom than even the ancient Romans were. Right on. I’ve always said that the US should have knocked out Saddaam and Co. and let the ‘people’ put in their own replacement. With one stipulation: If he acts up like Saddaam, he gets the same treatment. I know people will be wringing their hands, but that’s the way it is. And if it means no McDonalds in downtown Bagdhad, so be it. We have found out the hard way. Yay! I am so glad Australia won. It’s not as if it doesn’t happen here – outside of Dearborn. I lived in Lakeville and random gunshots went off on July 4, Veterans Day, New Year’s Day and whenever else the yahoos felt like it. I live in Harrison Township now and the (very American) idiot who lives behind me does the same. (And I called the police the last time – forget trying to get along with your neighbors – I’m tired of worrying about stray gunshots in a residential area). I fire an arrow in to the air, where it lands, I know not where. You are dealing with a tribal and sectarian culture, which Islam sustains. It is a case of arrested development. Nothing against Australia, but Australia is not a part of Asia, but Israel is. However, Australia plays in the Asia cup, but Israel can’t. A recurring problem experienced by Israelis living near Arab villages is the celebratory gunfire often heard after a wedding. I mean really! What other culture celebrates a joyous union with instruments of death? I still recall the scene in Lebanon as the PLO was being shipped out in 1983. 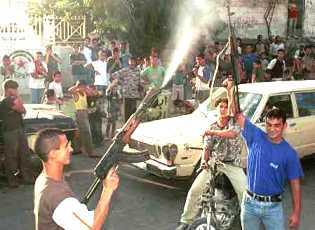 Allowed to carry their arms, they were defiantly “celebrating” their departure with machine gun fire on the docks. And a number of civilians were killed and injured when those bullets came back down. This always struck me as silly. Fire off blanks, if you like the noise, but not real bullets. It’s a waste of useful ammunition. That, and what comes up must come down. Anyone ever see “The Mexican”? What does Islam have to do with firing guns? They didn’t even have guns when Islam was invented? Are we just supposed to believe that those people are savages and racially inferior? No, they are just scumbags.